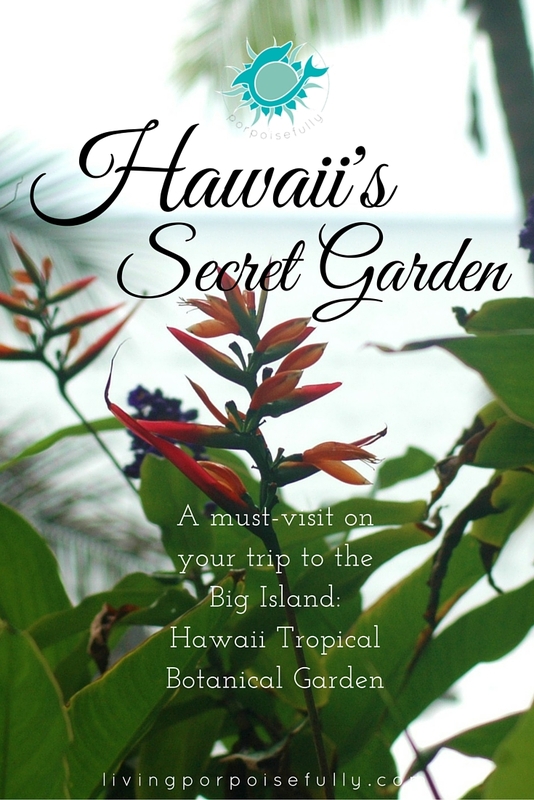 The Big Island of Hawaii has a secret garden unlike any other we’ve seen. Tropical flowers, waterfalls, and ocean views make for a breathtaking trail. Have you ever been to a place so magical and so surreal it feels like you dreamed it? We had one such “dream” in a magical garden in the big island of Hawaii that had not only such an incredible variety of tropical jungle-like plants and flowers, but also views of secluded waterfalls and crashing ocean waves on the craggy lava rock coast. Yes, waterfalls, ocean views, a path through jungle-like plants and beautiful tropical flowers all in one place! We continued down the path, surrounded on all sides and above by lush green tropical plants. Continuing on the path, we couldn’t believe the variety of beautiful plants and flowers the greeted us at every turn. The vibrant magentas, purples, and oranges against the lime greens made for countless photo ops! If the tropical flowers weren’t enough, surprises continued to amaze us. We came upon a beautiful well surrounded by an orchid garden. We lingered here a bit, awed by the many combinations of orchid colors. Moving further on our path, we came across a secluded waterfall. This path kept surprising us! After listening to the rushing water, feeling the secluded embrace of the jungle, and of course getting many pictures to remember it later, we finally moved on to yet another surprise: ocean views! There, we learned about a story about the Legend of the Twin Rocks, a rock formation that appeared in the place of two lovers that volunteered to protect the village. It was an amazing end to the incredible path through the gardens. We turned back, soaking in the lush greenery and flowers on our way back and paying homage to the Hawaiian tiki statue! Our visit to Hawaii Tropical Botanical Garden was certainly an unexpected experience of breathtaking views along the windy trail. If you’re headed to the Big Island, it would be well worth your while to stop and see it for yourself. For more travel insights into Hawaii, check out our Top 10 Must-Do Adventures in Hawaii post!